I guess my detractors would say “you should have known.” Wait, I have detractors? That can’t be. I’m a nice guy who only wants to help. You can’t know everything about wine, can you? So with that in mind, and a clear conscience, I think it’s safe to say, I don’t have detractors. So what is it that I should have known? A week or so ago, I saw that Binny’s in Naperville, IL. (I can use their name, they said it was okay, not sure if that was a good idea or not, but) was having a seminar (I love those) with Guest Lecturer, Francesco Zonin. Now if I have to tell you what the seminar was about or what winery Francesco is with, “you should know.” Since I haven’t been around winemakers/owners any time recently, I signed up to attend. As is my usual MO, I did some digging before I went to the seminar. This is the part where I found out a lot I didn’t know (hence, the “Who Knew” title of this post). Come to find out that Prosecco (anybody out there still needs assistance knowing Zonin Prosecco?) isn’t the only thing Zonin1821 makes. Why Zonin 1821? 1821 refers to when the winery was established. One hundred years later, Domenico Zonin started the development of this new winery in earnest, acquiring 8 additional properties throughout Italy. Ever expanding, in 1976 acquiring Barboursville Vineyards in (now here’s a real departure) Virginia! Historically a little too much to try and explain here, but suffice to say, James Barbour was a friend of Thomas Jefferson and began the vineyard in, now get this, 1821! The same year Zonin was launched. Not sure how much that had to do with the acquisition, but it’s a great storyline. They also acquired property in Argentina under the Dos Almas name. While I didn’t get as much time with Francesco as I would have liked, his presentation was superb. Beginning with his stature and those Italian features of his, good-looking man in my opinion, he went on to captivate the audience with an engaging and riveting educational seminar describing the appellation system in Italy, the various climates throughout the country and then onto the 6 wines that we were sampling that night. Mind you too that all through the seminar not only was he “all of the above,” but his sense of humor made the event priceless (sorry Mastercard). All six wines had their own features from the region of Italy where they began as wine. Hard not to talk a little about their hallmark wine, Prosecco. Most Prosecco is produced using “Metodo Martinotti” or Metodo Italiano, as they say in Italy, sometimes referred to as the Charmat method. Simply put, the wine gets its bubbles while the second fermentation is occurring in a large Stainless Steel pressure tank instead of in the bottle as is the case in Champagne. It was during this tasting that Francesco also mentioned an interesting tradition in Italy using Prosecco as sort of an aperitif, making a drink called “Aperol Spritz.” A concoction of Prosecco, soda water or sweet vermouth and Aperol (made of gentian, rhubarb, and cinchona, among other ingredients). Not to cast dispersions on Italians, but it sounded like this was sort of a “wake me up” sort or cocktail, maybe their version of our Bloody Mary? Since my daughter spent three years in Italy I looked to her for confirmation. She does recall seeing the bottles of Aperol at restaurants and such, but alas, she never partook of the drink. This may need to be on our agenda when she next visits. What Italian worth his salt (huh), wouldn’t also mention “FOOD?” True to form, Francesco pointed out a very traditional dish called Pasta Pomodoro. A simple dish prepared with pasta, olive oil, fresh tomatoes, basil, and various other fresh ingredients. Intended to be a quick light dish, rather than a dish in a heavy sauce. Last fun fact. Prosecco accounted for approximately 150 million bottles per year back in 2008, for 2018 it is expected to total 600 million bottles! Somebody knows something that I don’t know. Oh, no, not that again!! I won’t go into all six wines except to say I think my favorite of the evening was the Castello di Albola Chianti Classico 2015. Good bright fruit of strawberries and cherries finishing with a light spice note on a medium to light frame. Great everyday wine at $15, and perfect for that Pasta Pomodoro. I’ve attached the wine information on those six wines and you can see them by clicking here. Thank yous go out to Zonin 1821, Francesco Zonin and Binny’s for a wonderful and very informative seminar. Hey, and one less “Who Knew” for me. Yo Ho Ho and a Bottle of . . . . Rum? Wait! This is a Wine Blog, right? So what's all this about Rum? It's about expansion, it's about education, but mostly it's about meeting a co-owner of an artisanal Rum Producer, "The Real McCoy." Always looking to both learn and, to be totally honest, drink. I found myself attending a seminar on Rum production while also meeting Linda Lofstrom, Co-Owner and Regional V.P. of Sales for "The Real McCoy" Rum Company. Since I have the column about "Meet the Winemaker/Owner", I thought that I could incorporate this post even though it is about Rum. There are a number of similarities between spirit production and wine production. Plus, you never know when having a bit more knowledge on a particular subject may come in handy. Such was the case in attending this seminar. Linda took us through all the phases of Rum production, from harvesting the Sugar Cane, then to fermentation, distillation, maturation and finally the blending to create a final wonderful spirit. At each step, Linda pointed out the similarities, and more importantly, the differences, "The Real McCoy" uses in their handiwork. From their use of quality Blackstrap Molasses, to the use of old copper pot stills being used to this day, the oak aging and blending being done under the watchful eye of the 4th Generation family distillery in Barbados. Let us not forget the importance of Barbados. While Rum is produced in a fairly large number of countries, and under very little regulations, the importance of Rum production in the Caribbeans cannot be overlooked. As Linda explained, the higher heat in Barbados accounts for a high rate of evaporation (the Angel's Share) while aging in barrels, up to 7% a year. This is compared to Scotch and Whiskey that accounts for about 1 to 3% a year. Over 10 years, that means Rum from Barbados can lose up to 70% of the original liquid! Direct from "The Real McCoy" website, here's a little information on who Bill McCoy was and a video to go along with it: "Crafted in the prohibition tradition of America’s pioneer rum runner, Bill McCoy, The Real McCoy's suite of artisan-crafted aged rum from Barbados is made using only the finest molasses and purest spring water. Produced via a rare combination of column and pot stills, the product is then aged in American Oak whiskey barrels the old fashioned way, resulting in a smooth and fragrant rum. Unlike other rum producers, there are no additives of any sort. This multi-award winning line consists of 3-year-aged, 5-year-aged, and 12-year-aged rum. Perfect for sipping or mixing, it’s the Real McCoy!" Fast forward to the twenty first century, Founder and CEO, Bailey Pryor, came up with the idea to make "The Real McCoy®" Rum while producing a documentary film about Bill McCoy for Public Television in the United States. This is another video of the documentary Baily Pryor made leading to his discovery. Due to privacy settings, you will be directed to Vimeo to watch. One item, it's about an hour long! What about the Rum? Not that I've had a lot of Rums, but I can tell you that the 3, 5 12 and a special 10 year, were all excellent. Smooth, without any burn and wonderful flavors on them all. Linda pointed out, and I would totally agree, that the 5 Year is the most universal of them. Since you know how I like Scores and reviews, I would be remiss if I didn't point out that the 3, 5 and 12 Year Rums were rated 93, 92 and 94 Points respectfully by the Beverage Tasting Institute/Tasting.com. Pricing was what I would consider inline for an artisanal product of this sort, coming in at $19, $27 and $40 respectfully. I've decided to start a new column. One that is dedicated to those folks that are paramount in the wine business, the ones that have a say, and possibly a do, in winemaking. The Winemakers! This big revelation came about as I was headed out to a local wine shop to try some wines. They were fortunate enough to have the winemaker for the winery there as well. As many of you know (well, those of you that read this blog) I feel strongly that wines always taste better when you have something special going on. A visit to the winery, special events or in this case the addition of someone who is intimate with the wines and how they are made. I started thinking about adding this category a week or so ago when I was at another tasting for my next Monday's "Wine of the Week." That post will still be under "Wine of the Week," but could have just as easily been listed under "Meet the Winemaker" as well. Keep that in mind when you read next Monday's post. So this particular tasting featured wines from the Northwest, specifically Washington. I love Washington wines and have for some time. Their Cabernets are rich and pure and have a uniqueness all of their own. Then there are the Syrahs. Also big and rich and full of dark fruit flavors and that spiciness you get from Syrah. How could I not attend? So what winery did it for me this time? Sparkman Cellars! Don't be too surprised if you haven't heard of them before. I knew the name but not much about the wines themselves. The reason is that while they make a considerable number of different wines, they are all produced in extremely small quantities. The man responsible for all these wines, and the person I was so fortunate to meet; their winemaker - Linn Scott. Winemaker for Sparkman Cellars since 2010, Linn brought with him knowledge acquired during his time attending Universities in France and Germany earning a Master’s degree in Viticulture and Enology and proficiencies since his entry into the wine biz in 2001. As only my second time focusing on actually interviewing someone for my blog, I know this is an ongoing learning process for me, glad that in all my previous years (and there have been many) (there's my being old joke for the post) I did manage to learn a few things about interviewing. I was fortunate to have arrived a little early so as to be able to talk with Linn before he got too busy with the other tasters. My pre-interview time spent developing a couple of what I would hope to be interesting questions to ask proved worthwhile. Not wanting to ask the same questions I get at tastings, the biggest one which is always "what's my favorite wine?" I changed it up a little and asked Linn "Which wine does he enjoy MAKING the most?" I could tell he was thinking about it pretty hard, he even mentioned a couple things about a few wines that he likes. Then it hit me; just like a parent that gets the question about which one of their children do they like best, there can be no specific answer. A parent, like Linn, likes each one, but maybe for different reasons. 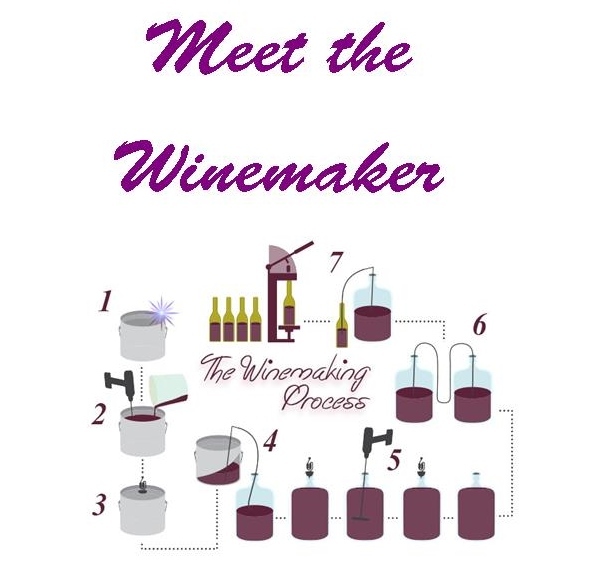 Another question I asked was if there is a particular time or event during the entire winemaking process he enjoys most. He again started thinking and talking about different times, mentioning his substantial time working in the vineyards. Once again, after some thought, he said he looks forward to each season as each brings its own challenges and contentment. If I can interject my own perception here (and why can't I since it's my blog) (testy aren't I), I feel that Linn is just really happy and enjoys his job. You can tell by the wines (great segway). We were presented with six wines, each one pleasant in its own way. The first a Dry Riesling (Birdie) that had lovely stone fruit notes and a flavor what I called "nuttiness." Chardonnay (Lumiere) up next. Great body with a nicely balanced palate with a touch of oak accent. First red is their Grenache (Wonderland) from Yakima Valley. Easy on the palate with red fruit and a subtle finish. Their blend (Wilderness) with Syrah, Tempranillo, Grenache, Petite Sirah and a couple others for good measure showed added nuances and flavors. Then we came to the last two. One being Syrah and the other Cabernet. Remember what I said above? What wines! The Syrah (Darkness) lived up to its name. Dark rich with a smokiness or earthiness that you find in Northern Rhone wines. Finishing in a long and nicely spiced finish (this was my fave). Lastly, the Cabernet (Kingpin). Excellent wine. Again, dark fruit with layers of flavor with that long subtle finish. The wines may be available in the area. If you have difficulty, you can go directly to their order page by clicking here. They have a boatload of wines not sold anywhere but through their website and to wine club members. You can click here to get the tech sheets for their current offerings as well.